Fri., Aug. 25, 2017, 10:12 p.m.
SYDNEY – Stanford coach David Shaw had been talking about the great Australian hospitality since his team arrived Down Under. During the team’s final contact practice at Moore Park near downtown Sydney, even the weather made him feel at home – gusty, chilly winds not unlike those that sweep off San Francisco Bay. But after visits to the zoo and Opera House and a harbor cruise, Shaw and his team are beginning to put their game faces on as Stanford’s midday Sunday game (Saturday night in the U.S.) looms against Rice at Allianz Stadium in Sydney. But it’s exactly that for both teams. The 14th-ranked Cardinal are starting the post-Christian McCaffrey era. 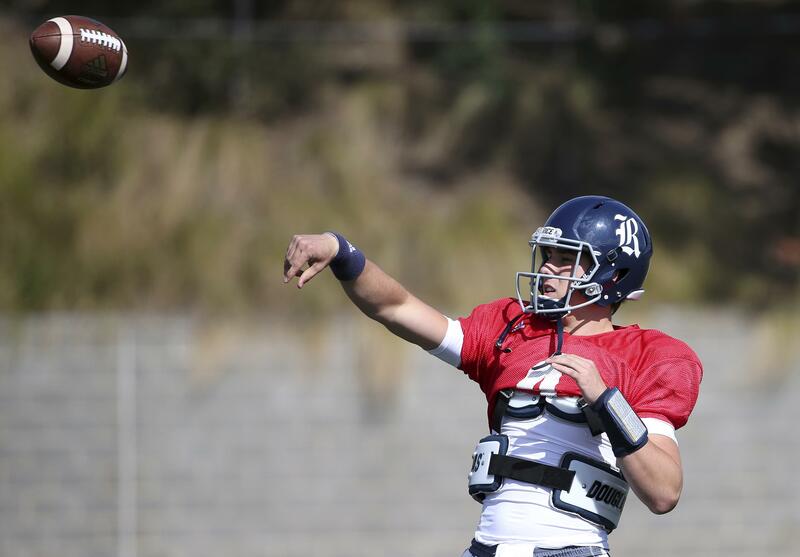 Rice will be starting quarterback Sam Glaesmann, a redshirt freshman who will be playing his first-ever college game against heavily favored Stanford. Running back Nahshon Ellerbe will also be making his first start for the Owls. Shaw said at the team’s final practice session ahead of Friday’s walk-through that he had decided on most of the offensive line starters for Sunday’s game, but would keep them to himself for now. There have been suggestions that although he has five starters in mind, there could be a rotation in place that could see up to 10 different offensive linemen play against Rice. The New South Wales state government, in a tourism promotion, paid millions to fly over both teams, the second year in a row that a regular-season college game has been played in Sydney. (Cal beat Hawaii 51-31 last year before 62,000 fans at the Olympic stadium in the first game of the 2016 season.) They got a quick return on their investment from Rice coach David Bailiff at the opening media conference. “I think I’m changing where I’m going to retire,” Bailiff said. “I’ve been here five hours and already I’m thinking I’ve got to consider Sydney. You look at the backdrop of this place, driving over here, just the architecture downtown, how it’s so much old and so much new and it’s all blended.” Officials expect nearly a full house in the 45,000-seat stadium on Sunday. Stanford quarterback Keller Chryst, who tore the ACL in his right knee in Stanford’s 25-23 win over North Carolina in the Sun Bowl on Dec. 30, appears to have fully recovered from the injury. Chryst was 6-0 as a starter last season with 10 TD passes and only one interception in those games. Shaw said Chryst’s recovery surprised him, and he’s good to go for the opener: “I anticipated taking it slower in camp with him, but he asked me to take the training wheels off.” Another player to watch is running back Bryce Love, who is stepping in for McCaffrey, now playing for the NFL’s Carolina Panthers. The Cardinal will have longtime Stanford personality Bob Murphy on their minds when they play. Murphy, who died Tuesday at age 86 after battling Alzheimer’s for several years, covered all the bases at Stanford –a standout pitcher, longtime broadcaster and a sports information director. He was known simply as “Murph.” “We certainly lost a Stanford icon today,” Bernard Muir, Stanford’s athletic director, said in Sydney. Stanford plans to honor Murphy at the first home game of the season against UCLA on Sept. 23. Published: Aug. 25, 2017, 10:12 p.m.